Matthew B. Crawford is a philosopher and mechanic. He has a Ph.D. in political philosophy from the University of Chicago and served as a postdoctoral fellow on its Committee on Social Thought. Currently a fellow at the University of Virginia's Institute for Advanced Studies in Culture, he owns and operates Shockoe Moto, an independent motorcycle repair shop in Richmond, Virginia. "It's appropriate that [Shop Class as Soulcraft] arrives in May, the month when college seniors commence real life. Skip Dr. Seuss, or a tie from Vineyard Vines, and give them a copy for graduation.... It's not an insult to say that Shop Class is the best self-help book that I've ever read. Almost all works in the genre skip the "self" part and jump straight to the "help." Crawford rightly asks whether today's cubicle dweller even has a respectable self....It's kind of like Heidegger and the Art of Motorcycle Maintenance." "Matt Crawford's remarkable book on the morality and metaphysics of the repairman looks into the reality of practical activity. It is a superb combination of testimony and reflection, and you can't put it down." "Every once in a great while, a book will come along that's brilliant and true and perfect for its time. Matthew B. Crawford's Shop Class as Soulcraft is that kind of book, a prophetic and searching examination of what we've lost by ceasing to work with our hands-and how we can get it back. During this time of cultural anxiety and reckoning, when the conventional wisdom that has long driven our wealthy, sophisticated culture is foundering amid an economic and spiritual tempest, Crawford's liberating volume appears like a lifeboat on the horizon." "This is a deep exploration of craftsmanship by someone with real, hands-on knowledge. The book is also quirky, surprising, and sometimes quite moving." "Matt Crawford has written a brave and indispensable book. By making a powerful case for the enduring value of the manual trades, Shop Class as Soulcraft offers a bracing alternative to the techno-babble that passes for conventional wisdom, and points the way to a profoundly necessary reconnection with the material world. No one who cares about the future of human work can afford to ignore this book." "We are on the verge of a national renewal. It will have more depth and grace if we read Crawford's book carefully and take it to heart. He is a sharp theorist, a practicing mechanic, and a captivating writer." 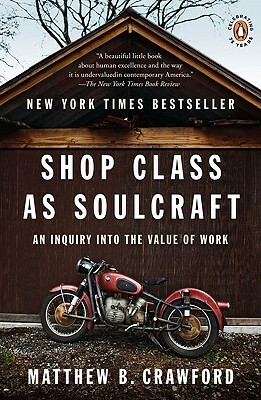 "Shop Class as Soulcraft is easily the most compelling polemic since The Closing of the American Mind. Crawford offers a stunning indictment of the modern workplace, detailing the many ways it deadens our senses and saps our vitality. And he describes how our educational system has done violence to our true nature as 'homo faber'. Better still, Crawford points in the direction of a richer, more fulfilling way of life. This is a book that will endure." "Crawford reveals the satisfactions of the active craftsman who cultivates his own judgment, rather than being a passive consumer subject to manipulated fantasies of individuality and creativity." "Philosopher and motorcycle repair-shop owner Crawford extols the value of making and fixing things in this masterful paean to what he calls "manual competence," the ability to work with one's hands. According to the author, our alienation from how our possessions are made and how they work takes many forms: the decline of shop class, the design of goods whose workings cannot be accessed by users (such as recent Mercedes models built without oil dipsticks) and the general disdain with which we regard the trades in our emerging "information economy." Unlike today's "knowledge worker," whose work is often so abstract that standards of excellence cannot exist in many fields (consider corporate executives awarded bonuses as their companies sink into bankruptcy), the person who works with his or her hands submits to standards inherent in the work itself: the lights either turn on or they don't, the toilet flushes or it doesn't, the motorcycle roars or sputters. With wit and humor, the author deftly mixes the details of his own experience as a tradesman and then proprietor of a motorcycle repair shop with more philosophical considerations." "Philosopher and motorcycle mechanic Crawford presents a fascinating, important analysis of the value of hard work and manufacturing. He reminds readers that in the 1990s vocational education (shop class) started to become a thing of the past as U.S. educators prepared students for the "knowledge revolution." Thus, an entire generation of American "thinkers" cannot, he says, do anything, and this is a threat to manufacturing, the fundamental backbone of economic development. Crawford makes real the experience of working with one's hands to make and fix things and the importance of skilled labor. His philosophical background is evident as he muses on how to live a pragmatic, concrete life in today's ever more abstract world and issues a clarion call for reviving trade and skill development classes in American preparatory schools. The result is inspired social criticism and deep personal exploration. Crawford's work will appeal to fans of Robert Pirsig's classic Zen and the Art of Motorcycle Maintenance and should be required reading for all educational leaders. Highly recommended; Crawford's appreciation for various trades may intrigue readers with white collar jobs who wonder at the end of each day what they really accomplished."